With Dead Rhetoric keeping a close eye on Boston’s Seven Spires for the past few years, it seemed logical that we should be sure to check out their first ever full-fledged US tour. Combining forces with Chicago’s Hate Storm Annihilation, the pair are in the midst of hitting a slew of states, as well as trekking north for a few Canadian ones. Reaching the halfway point of their tour, a Thursday night stop at New Jersey’s Dingbatz was in order. A diverse offering of metal talent was waiting in the wings. A trio of local acts served to be a pleasant treat to open up the festivities. 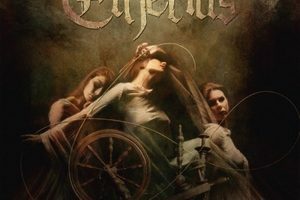 First up was Etherius, an instrumental progressive act out of New Jersey. Frantic, neoclassical melodies and shred courtesy of guitarist Jay Tarantino was a true highlight. Lots of energy for an instrumental act – the type of thing where you don’t ponder about vocals for a second while they play. The band’s first EP, Thread of Life, will be out this summer. Next up was New York based power metal act Sacred Ash, who delivered an equally compelling experience. Plenty of classic metal vibes running through the music, but with a tinge of modern flavor to them. Some fun guitar hero antics on stage meshed well with the energetic and often upbeat nature of the material, and vocalist Mark Bellson had some real air siren power behind his vocals to round it all out. Impressive stuff, and worth looking into further if you see them on a bill in the near future. The last of the locals acts for the night were Erciyes Fragment, a symphonic death metal band also from New Jersey. Combining melodic death metal, synths, thrashing tempos, and a slight ‘core vibe, they continued to build upon the energy of the previous acts and bring it one step further. Heavy, catchy, and with some thunderous grooves, the band seemed to be quite a draw, and for good reason. Culminating things at the end, vocalist Giovannie did his work from the floor with passionate results. Yet another band from the evening that appeared to be firing on all cylinders. That led us up to Hate Storm Annihilation, an extreme death metal 3-piece that seemed to remind a bit at times to another “hate” band – that being Hate Eternal. Chaotic, blistering speeds with some rather impressive drum work seemed to be the order of the day (clearly with a band name like this, you can’t do much other than deliver sonic devastation). But some needed slowdowns were there at times to keep the whole thing from being a blur of blasts and swirling riffs, and the band had a good sense of humor about them – something more bands like this need. Tracks like “Lucifer Rising” and “The Cleansing of Humanity by the Blackened Sun That Shadows the Filth Below” delivered the high-octane extremity that fans crave. Last up was Seven Spires, who were able to play plenty of cuts from their debut full-length, Solveig. Having only seen the band opening for others, this extensive setlist was a welcomed indulgence. A deserved headlining run considering the effort they’ve put in over the past few years, the band was clearly taking full advantage of the opportunity to grasp the spotlight. The unit has become even more interactive with each other on stage with vocalist Adrienne Cowan, guitarist Jack Kosto, and bassist Peter Albert de Reyna offering plenty of smiles and fun outside of the shreddy and theatric tones of the music. They’ve also seemed to pick up on what works best in allowing each member to have their moment, even going into a drum solo following “100 Days” (a treat in and of itself for Cowan’s vocal performance) to give Chris Dovas his due. The first time this scribe has been able to catch them following the release of Solveig, witnessing some of their heavier cuts like “The Paradox,” “Serenity,” and “Burn” only further support their ability to be musical chameleons, able to manipulate and splice genres into something that is uniquely their own. Whereas “Choices,” “Ashes,” and “The Cabaret of Dreams” provided that ‘fist-in-the-air’ symphonic metal splendor. 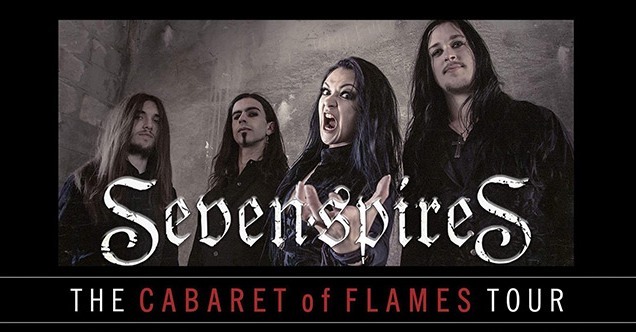 Whether it’s headbanging heaviness and glorious guitar soloing or sing-a-long power metal-esque choruses, there’s a reason Seven Spires continues to elevate themselves in the metal community: they have a personality that’s unique and most be fully absorbed in the live setting. May they continue to rise to the top.